Some of the best things you’ll find on your St Thomas Boat Rental are the things you didn’t plan…like amazing encounters with friendly dolphin, elegant turtles, and giant whales! Did you know that when the water grows warmer in North America, whales and dolphins travel our very own Sir Frances Drake channel with their calves in tow? It’s true, and its one of the most amazing things you’ll ever see. 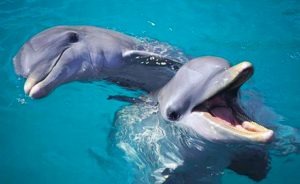 The Virgin Islands are host to Humpback and Sperm whales and bottlenose, spotted and spinner dolphins. If you’re lucky, you may get to see one–or many of these magnificent creatures while snorkeling or swimming off the coast of St Thomas during the winter months. After birthing their calves in South America, whales and dolphins return to the Virgin Islands, where the calves spend the first few months of their lives in the warm Virgin Islands waters, building up layers of blubber to keep them warm in the colder seas. They travel past the Northeast point of St Thomas, and are sometimes seen off the west coast of St. John. 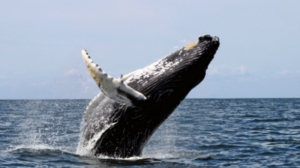 If you’re in the Virgin Islands in February or March, whale watching is a popular activity, and the whales and dolphins put on quite a show, frolicking in the warm Caribbean waters. One incredible and almost indescribable experience is to hear the singing of the humpback whales. Because the singing is performed mainly in the mating grounds, researchers believe they are part of the mating and birthing ritual. 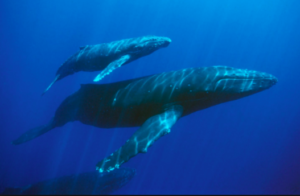 Some believe its a form of communication between the whales, and the songs can be heard up to 100 miles away. According to experts, the songs last between 5 and 20 minutes and are organized into phrases that are repeated several times during the song. The song, often with 5 to 7 different phrases (or themes) is repeated often, without stopping. The result is a hauntingly beautiful sound. Traveling through the same channels and at the same time of year are several species of dolphin. Even though dolphins are protected as well, no one’s told them, because they’re playful and friendly, and love to put on a show. They’ll follow the wake of the boat, jumping in and out of the water, and if you’re snorkeling, they’re comfortable hanging around and sharing the water with you. They typically travel in small groups, and really enjoy the opportunity to show off, so enjoy it, but don’t touch them! 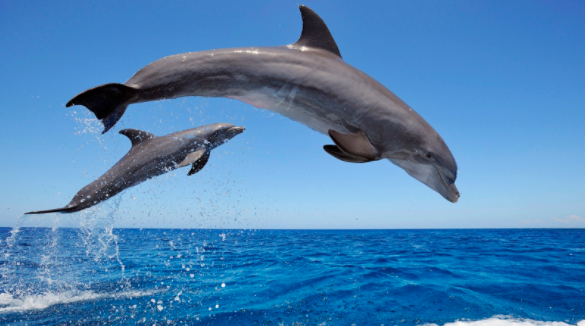 These incredible creatures travel the waters between November and May, but the most sightings occur in February and March, so if you’re lucky enough to visit the Virgin Islands during these months, keep a watchful eye for whales and dolphins on your St. Thomas boat rental! We had an incredible experience one day off Norman Island with a pod of dolphin, and caught it on video! See the video here!